I have my reservations about online dating considering A: I have the worst luck in dating and I meet people in person and B: There are some real creeps out there! Online dating has made women even more accessible to men on the prowl. Some guys (not all) who utilize these sites aren’t even looking for a relationship. They are looking for their next hook up (watch out ladies). I came upon a story about a man who actually used a spread sheet to keep track of all the women he met online. 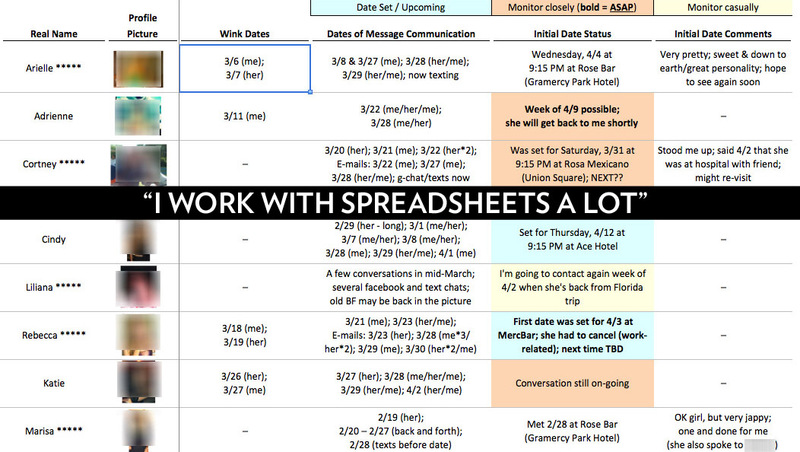 He would use the spread sheet to rate the women and keep track of the communications and the hook up potential. Gross! I am not saying that all men who use online sites are creepers, but they are definitely out there! When meeting up for the first time DON’T, I repeat, DON’T let them pick you up from your house. Always meet them somewhere. That way they don’t know where you live and you have an exit strategy just in case. Be careful about the information you provide. I suggest leaving off anything personal such as if you have kids, your real name, where you work, etc. You might think that lying withholding the truth is a bad thing but you don’t know these people! Would you go up to a random stranger and give out this information…probably not. If the both of you make it to the next level, be honest by explaining to them that you were protecting your identity and only feel comfortable sharing personal information with the people you choose to get to know. Don’t rush into anything. Get to know them by chatting over email (I suggest setting up an email specifically for online dating), Gchat, Skype, etc. There are multiple ways you can get to know someone without giving out your personal contact information. Keep pictures to a minimum. Two pictures (one up close, one full body) are good enough. Listen to your intuition, it’s there for a reason. If you feel that something isn’t right, listen! Remember: People can create a new identity online and that goes for online dating sites as well. There is no need to rush into something with someone you met on the screen. Take your time and get to know them. **The goal of this blog is not intended to scare you or deter you from trying online dating. There are plenty of people who actually look for love and find love through online dating sites.